It's been one heck of a year for horror. In particular, it's been a banner year for long-running horror franchises making their very welcomed returns. Halloween is easily the biggest and perhaps best example of this, but Puppet Master: The Littlest Reich also brilliantly (and bloodily) revived the puppet slasher series. And not for nothing, but Robert Englund even returned as Freddy Krueger in an episode of The Goldbergs for the first time in more than a decade. What more could we ask for? How's about a brand new Leprechaun movie that completely reinvents the franchise for a new generation? That's exactly what we're getting in Leprechaun Returns, which takes a similar approach to the new Halloween. Instead of messing around with the long-standing continuity of the original movies, which saw the horror icon go to the hood (twice) and even to space, director Steven Kostanski (The Void) and SyFy decided it was best to ignore every sequel in the franchise, as the new Halloween did, in favor of crafting a direct sequel to the 1993 original. Warwick Davis had played the character in every single entry, six in total, up through 2003's Leprechaun: Back 2 tha Hood, but he opted not to return for this latest reboot. A previous attempt at a reboot took place in 2014 with Leprechaun: Origins, which featured Dylan Postl, aka WWE Superstar Hornswoggle, taking up the mantle. This time around, however, there's a new Leprechaun in town carving up bodies in order to find his missing pot of gold, and his name is Linden Porco. Even though this doesn't quite carry the same weight as playing Michael Myers or Jason Voorhees, this is a horror franchise that has endured for 25 years. That's not something many franchises can say. With that, taking on the role does carry some pressure and, for those who do love these movies, they're quite attached to the Warwick Davis version of the character. But with Davis not particularly interested in coming back, that left room for Porco to stake his claim and make the role his own. Linden Porco got his start working alongside the Wayans brothers in 2006's Littleman and has had roles here and there in projects like Sunnyside and Channel Zero. Now, he has his sights set on becoming the new face of a revamped franchise. I had the chance to speak with Porco all about his experience working on Leprechaun Returns, in addition to his hopes for any possible sequels and his future career in general. 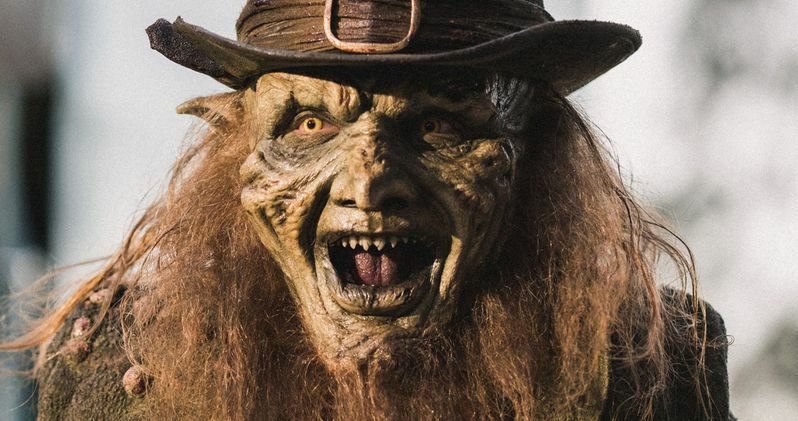 So, without further adieu, here's my chat with the new man behind the murderous Leprechaun. At What Point did you board the project and how involved were you in the creative process? Linden Porco: I auditioned for it. I ended up getting it, which was awesome. The creative stuff happened a little bit on set as well to help transform the character into being my own a bit. I wasn't too in on the creative process at the beginning stages of it, but I sort of tossed in my creative side as soon as I got the role and put 150 percent into it. I think it shows. You mentioned wanting to make the role your own since there had been so many movies prior to this one and Warwick Davis is obviously the most associated with the role. Did you speak to him at all before this? Linden Porco: I didn't talk to him beforehand. I would have loved to. I watched the first film while I was in South Africa to get a taste of what he did but I pretty much just went after the character and did a lot of my own thing, just kind of how I felt in the moment. Obviously, there's hints of Warwick Davis in there because he's such an iconic character that you've got to toss in things here and there. I kind of just wanted it to be my own thing and just go after it. It did feel, as someone who has seen quite a few of these, very much connected to what came before, but you did bring something to it. In your head was there something specific that you were trying to bring to the role that wasn't there before Leprechaun Returns? Linden Porco: I would just say that I based it off of Heath Ledger's Joker. Just that kind of mysterious "I don't care" mentality while I was in the scene and just had fun with it. It was amazing to play this character and I kind of just went after it and whatnot. That's an interesting touchstone. Most people wouldn't think of The Dark Knight as a horror-related thing, but that is very much a terrifying performance. It's an interesting way to approach that, I think. Steven, the director, what were the discussions like between you and him in terms of crafting the character before you started filming? bold: Linden Porco: It was amazing. We collaborated great. We're actually both from Winnipeg, so that was awesome to connect that way as well. We just collaborated between scenes. After a take to see what he thought, what I think, and I think, overall, it was amazing, but the collaboration just made it that much easier. I get the sense that he's a big horror fan, since there are so many hat tips to these other classic horror movies. Were you always a fan of horror or did you just find yourself in this world as more of an acting challenge? Linden Porco: I actually, to be completely honest, am scared s***less of horror. I do not go and watch a horror movie or TV show because I'm just scared crapless. I remember this one scenario, I think I was watching one of the Ouija movies, and my buddies tried to get me into the movie theater and I was hesitant to go, but I ended up going, peer pressure and all of that crap. So, I went and the whole movie I had my hood over my eyes basically just trying not to watch this movie because I was so flippin' scared. Linden Porco: I think it was a great acting challenge for sure to play this role. I mean, an iconic role like this is amazing. But yeah, no. I'm not a huge fan of horror. Getting back to the challenge of it, do you think not being a fan of horror because it scares the crap out of you helped you to embody something that was terrifying? Because you know, "Oh, this is what would scare me." Or did it make it more difficult since you didn't have as much reference point with horror movies going in? Linden Porco: I think it helped me that I thought about, it's exactly what you said, is that it would scare the crap out of me. So when I thought of that I was like, "Okay, just go in there and do your thing." I also wanted to be as truthful to each scene and the way I felt. But having that in the back of my mind definitely helped to guide the way for sure in what I was trying to pursue. In as much as this is a horror movie, this franchise has always had a layer of cheese and camp to it. Specifically, you have these fun little one-liners. Is the trick to just fully embrace that? Or is it, in your mind, to take it very seriously? And be like, "This is who this character is." Linden Porco: I definitely embraced the character every time the camera was rolling. But at the same time, you need to have fun with it as well because if you're not having fun, to me at least, then it's just kind of like, what am I doing if I'm not having fun with it? I went after the character. I had tons of fun and I just let loose. We did a few takes where I was like, "Just give me one more. I'm just gonna go for it and see what happens." I would do that and a lot of the time I would think those were the best takes. Not to give too much away for those who haven't seen it, but the ending sets the table for the future. Do you see yourself coming back for a sequel? Is there talks of doing a sequel yet? Linden Porco: I would love to come back for a sequel. That would be absolutely unbelievable. The cast, the crew. Everybody was phenomenal. Everybody was so nice. I would love to come back for a sequel. Not that I'm aware of, of talks of a new one, but count me in if that happens. For sure. This is a franchise that's endured for a really long time. Having been in it yourself now, do you have any insight as to what you think it is that has made the Leprechaun franchise last for 25 years? Linden Porco: I think his wittiness and how comedic he is. Also, truthful to who he is as a Leprechaun. And the motive. All he's wanted to do is go and find his gold. He's not going to kill you for no reason. He's going to kill you to get his gold. I think that how it all works and how everybody relates to it as fans is that it's not just horror. It's comedy as well. When you mix the two it makes it a lot more fun for sure. Are there any kind of projects on your dream wishlist? A specific franchise you would like to join? Or anything as an actor that you would love to do in the future? Linden Porco: I would love to pursue work with Marlon Wayans again and the Wayans brothers. I think that's what really set my pursuit of acting off. A few people I'd like to work with would be Kevin Hart, Mark Wahlberg, The Rock, Dwayne Johnson. Those people I think would be amazing to work with. And then obviously Peter Dinklage would be a huge person I would love to work with. A lot of those guys you mentioned are big action stars. Would you see yourself doing more of an action movie given the opportunity? Linden Porco: I definitely have ideas in my head for an action movie. I'm a very physical actor. I do all of my own stunts. So I would absolutely love to do an action movie with those guys. What would you want to bring to the table, or any ideas you might have that you didn't get to put into the first one, if you get to make a sequel? Linden Porco: I would definitely like to be in the process of creating the next movie and just making it even more my own, especially since I've done the first one. But also bringing, I think having Warwick Davis' input into it as well. I would definitely try and reach out to him if we do another and just say, "Hey, what are your ideas?" I would love to incorporate them into this as well. But yeah, just bringing in my style, tossing my ideas around. That kind of thing. We'll just have to wait and see if it gets another one. I actually haven't even seen it yet so I'm looking forward to seeing it. Luckily for Linden Porco, and everyone else, seeing Leprechaun Returns has been made rather convenient. The reboot officially hits digital platforms on December 11. And, with any luck, we'll be seeing another sequel in the future.